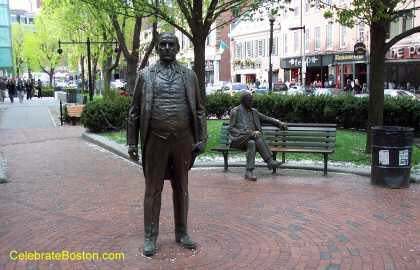 Along the Freedom Trail, just past Faneuil Hall, are two statues of James Michael Curley (1874-1958). Curley was the Mayor of Boston for four separate terms, and Governor of Massachusetts for one term. His first Mayoral term was from 1914 to 1917. The following describes portions of Mayor Curley's autobiography, I'd Do It Again!, having been read by this author many years ago. Curley was of Irish descent. As a child his family was extremely poor. He grew up in a cold water tenement in the South End, which had a collective outhouse in the backyard. When he was a young man, there was still great friction and discrimination between the Boston Irish and English families. Boston politics experienced great change from 1890-1910. Curley described the rise of Ward Bosses, or neighborhood leaders that set out to organize the poor into voting as a group. This effort greatly increased their political power. He states that coercion, bribery, and even violence, had occurred during this period of time (as happened in other cities). Curley first attained the office of Mayor in 1914. His goal was to raise the standard of living of Boston's working poor. During the election "jobs for votes" were promised, and this would be the means for lifting people out of poverty. Curley supported public works projects including the "Emerald Necklace" system, a semi-circle of public parks in this city. Later, he initiated Great Depression projects such as the construction of municipal stadiums, and in making public transit system improvements. James Michael Curley was a very controversial figure. While a Boston Alderman early in his career, he served time in the Charles Street Jail for taking a civil service exam for a friend. Six months of his final Boston Mayoral term was spent in a Federal Penitentiary for mail fraud. 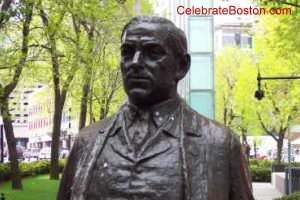 Curley did succeed in greatly increasing the stature and income of Boston's working poor, his primary goal. As a note, this author regrets that the original "jobs for votes" doctrine, which was based on strong immigrant work ethics, has evolved into less efficient government in Massachusetts in some areas. Spencer Tracy starred in the film, The Last Hurrah, which is loosely based on James Michael Curley's life.